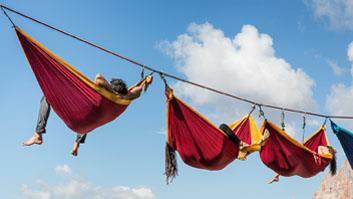 People relaxing in hammocks around 40 meters above the ground. This took part in an annual highline meeting in Monte Piana, in the Italian Dolomites last autumn. For some it might look like a nightmare to dangle so far above the ground but for some this was just the way to take a rest.